The work requirements of the 1996 welfare reform legislation have refocused attention on the need for government programs that help members of economically disadvantaged segments of the population find and keep jobs. 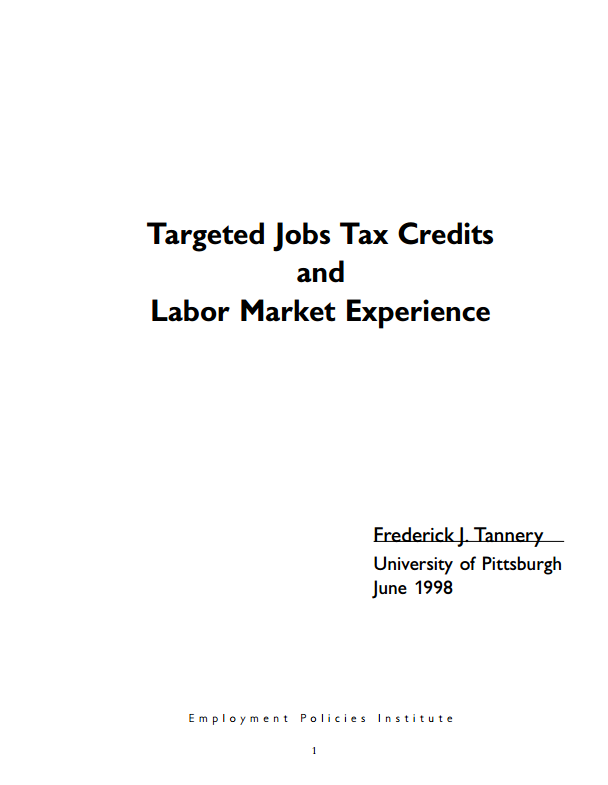 In this report, Dr. Tannery examines the effectiveness of one such program, the Targeted Jobs Tax Credit (TJTC). Based upon a long-term analysis of more than 17,000 Pennsylvania workers, he finds that participation in the TJTC program had a strong positive effect on workers’ earnings and labor force participation, and that this effect persists for many years after participation in the TJTC program. Dr. Tannery examines the earnings and labor market tenure of two groups of workers eligible for TJTC, disadvantaged youths aged 18-22 and welfare recipients, for evidence regarding its effectiveness. Specifically, he compares the earnings of workers who applied for and were certified by the government as eligible for the TJTC with the earnings of workers who applied for but were disqualified from the program because of paperwork or other application problems. The characteristics of these two groups of workers are unlikely to differ in any systematic way; hence, the analysis should provide unbiased evidence about whether or not the TJTC program increased the earnings and job tenure of eligible disadvantaged workers. Among welfare recipients, Dr. Tannery finds that participation in the TJTC program led to substantial earnings gains for eligible female workers. Certified female welfare recipients in their late 20s and early 30s earned from 9% to 32% more per quarter than their uncertified counterparts. For the average female worker earning approximately $1,800 per quarter, these results imply an earnings differential of $650- 2,300 per year in each of the four years studied. Hence, the cumulative income gains to TJTC participants exceed the $2,400 maximum per-worker cost of the program. Dr. Tannery analyzes the earnings of disadvantaged youths during the first four years after their eligibility for the TJTC program expired at age 22. He finds that certified workers aged 23-26 earned between 18% and 28% more per quarter than comparable uncertified workers. For the average worker earning approximately $2,500 per quarter, this translates into a difference of $1,800-$2,800 per year in each of the first four years after which a disadvantaged youth is no longer eligible for the TJTC. This once again suggests that the cumulative income gains to TJTC participants exceed the $2,400 maximum tax credit granted to employers. experience attributable to TJTC subsidized employment explains at least part of the earnings differential between certified and uncertified workers. the TJTC program an especially effective policy tool for fighting poverty. Did the TJTC Program Create Jobs? Because many of the TJTC program’s participants were certified for the tax credit after they had been hired, critics argue that the program created very few jobs. What these critics ignore, however, is the fact that the TJTC is an incentive for employers to lengthen the tenure of these jobs, which are typically short-term in nature. It is precisely this increase in tenure, and the accompanying job experience, that leads to the greater earnings associated with TJTC certification. Moreover, the retroactive certification process may well have benefitted those who were not certified for the TJTC by creating job openings that would not have been available in the absence of the TJTC. Employers hired many of the certified and uncertified workers based upon the knowledge that some percentage of workers would eventually be certified for the tax credit. By lowering a firm’s aggregate labor costs, the TJTC increased demand by these firms for all potential TJTC workers. In this study, Dr. Tannery demonstrates that the societal benefits of wage-subsidy programs such as the TJTC go far beyond job creation. These programs also lead employers to extend the job tenure of targeted workers who are members of disadvantaged groups. With greater experience, the earnings of these workers will rise not only during their participation in the program, but for the rest of their lives. Hence, the cumulative benefits of these wage-subsidy programs are far greater than previously thought. Similar programs might be especially effective as policymakers seek ways to find employment for the most-difficult-to-hire welfare recipients, those who have thus far been unable to find work even in a booming economy.